Ganesh Himal Panorama Trek is an almost a virgin trekking trail in Ganesh Himal Region, a less touristy area rewards every trekker with breathtaking Panorama of Ganesh Himal, Manaslu, Annapurna and Langtang range, experience rural life of local people, enjoy the natural beauty and serenity. The alleys that you will follow are simply a creation of nature. Visitors can observe the blossoming of vivid floras and fauna if you will ever trek in this region during the spring time. Blooming of orchids, rhododendrons, jasmines and other wild floras are most commonly seen in this region. In addition the area also offer you, an excellent habitat for a wide variety of plants and animals; 526 species of plants (including 40 species of orchids), and 300 species of birds. Other interesting wild animals are the Himalayan Thar, Gaur, many kinds of Monkeys and musk Deer. There are some interesting panoramic viewpoints, which are called Singala pass, Pangsang Bhanjyang, Jaisal Kunda. These places offer more than 40 mountains over 6000m (19´680ft.). 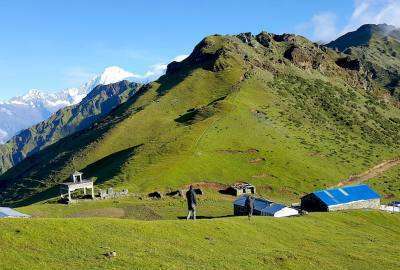 This trek also can be combined with Tamang Heritage Trail Trek and even continue to Classic Langtang Valley, Gosainkunda Helambu Trek to extend. Day 01: Meet at the group hotel in Kathmandu. Transfers from Kathmandu Airport are provided. Day 02: Drive to Arughat Bazaar (530m), a large village on the banks of the Burhi Gandakhi River. Day 03: Follow the Manaslu trail to Arkhet, then cross the river and trek up to the Lapu Danda (1026m). Day 04: Trek via Dhunchet to Lamo Dhunga (1930m). Day 05: Mostly a forest walk today to our camp in a clearing at Nauban Kharka (2710m). Day 06: Cross the Myanghal Bhanjyang and descend to Lapagaon (1700m). Day 07: Descend to the river, cross 2 bridges and hike back up to Borang (1625m). Day 08: Trek to Sertung (1900m) and optional afternoon visit to Phyangchet Monastery. Day 09: Trek via Tipling to Marmelung Kharka (3000m). Day 10: Ascend to the Pansang La (3850m) and camp there. Day 11: Trek south on the Tiru Danda to a camp at Gokchet (3660m) below the Sing La. Day 12: Cross the Sing La (4000m) and descend to Gongam Bhanjyang (2900m). Day 13: Descend through forest and then farmland to Kipsang Pokhari (1790m). Day 14: Drive back to Kathmandu, where we check in at the group hotel. Day 15: Departure day. Kathmandu airport transfers provided. Free airport-hotel-airport pick and drop by private car or van as per group size. Accommodation, meal and guided sightseeing in Kathmandu. Me quedaría corto poniendo un titulo para la opinión que merece mi amigo Pradip. En dos ocasiones he viajado a Nepal, y en ambas he contado con el servicio y la inestimable ayuda de mi amigo Pradip. Persona culta, responsable y muy profesional. La primera vez visitamos el Annapurna y la Segunda hicimos un trecking a Sertung con el propósito de entregar material escolar a las aldeas de los alrededores. Un viaje increíble, donde pude contemplar unos paisajes impresionantes, y unas gentes maravillosas. Recomiendo encarecidamente a quienes pretendan organizar un viaje a Nepal, cuenten con el magnifico servicio de este amigo; no os arrepentireis.